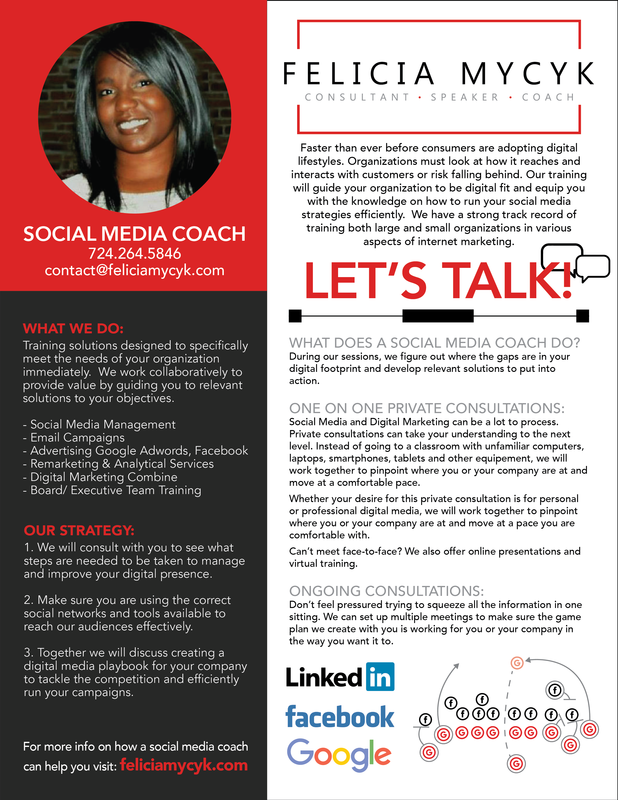 ﻿Certified in Social Media Marketing offering one-on-one or team training, workshops, and presentations on social media for all levels of skill. Services include, but are not limited to content management, digital ad creation, management, strategy, privacy, and building awareness. I have consulted with community governments, organizations, public figures, politicians, business owners and everyday people. I believe in your success and privacy therefore I am unable to list all my clients due to confidentiality. "I highly recommend a conversation about anything, but more specifically about business, with Felicia. In just our first of many, 30 minute meetings, she has guided me thru the obstacles of social media, and set me up to succeed in my own businesses! Her wealth of knowledge is impressive especially as I try to apply the most modern and convenient ways to share what I do, she has shown me how to do it better! One of the best investments I have made was spending that time with her. That investment has already given me many returns!" "Felicia and her team have developed Ambridge Connection into being one of our community's primary news sources. Beyond local news, her efforts have helped build a renewed sense of community. Ambridge Connection has enabled the citizens of the Ambridge Area to be more involved in their local governments, the local economy and has allowed for an opportunity to have a unique, impartial channel of communication that has netted a positive movement for our community"
﻿﻿﻿I focus on goals not tasks but at times you may need someone to help do the work (tasks) or guide you in the right direction. Our team can help you focus on what really matters to you most. Click to see list in greater detail.